This post will talk about Crossfit Garage Gym Packages and Garage Gym Ideas on a Budget! If you want to get fit and have an opportunity to do Crossfit, you should do it! It can definitely help you get into shape. Another great advantage of Crossfit is that you have a large community to interact with (both locally, and online), which helps with your mental health as well as your physical fitness. But what if getting to a Crossfit location is inconvenient? Well, you could opt for using your membership fees to instead convert your garage to a Crossfit gym! The only disadvantage of having your gym at home is that you won’t have a coach to correct your posture, or other people to hang out with. But the advantage is that you will save on travel time & gas, and you can exercise whenever darn-well feel like it. Let’s get started on how you can set up your Crossfit garage gym, shall we? Setting up your Crossfit garage gym properly is very important because you might need your garage to park your cars. Go figure. But you can easily measure your garage and with a bit of research on the equipment that you’ll need, you can decide on the perfect set up. The objective is to put in a full Crossfit garage gym, park your cars, and ensure that any yard equipment that you keep in your garage has space (see our organization articles that can help you with that!). 1. Decide on the equipment. The lesser the space and the budget, the more you will have to prioritize the equipment that you will need to buy. If something can do more than one thing, then it might be just what you need. 2. Keep your goals in mind. The best way to ensure the perfect gym layout is to keep your goals in mind. Do you want to build strength? Do you want to lose weight? Is cardio most important to you? Once you have your goals in mind, you can decide on the optimum equipment. 3. How frequently will you use it? Look at the source of WODs that you prefer. Check the RX weights and the bells. Check if you need a full set or not. As your strength increases, you can increase the weight of the plates and the bells and keep buying heavier ones as needed. Depending on your budget, there are many Crossfit garage gym packages available on the market. You can buy complete packages on Amazon, or you can check which individual items are the most useful for you and buy that equipment. The first step is to understand what equipment you will need as part of the gym package. Most of the packages available are single type equipment. Check out this Crossfit garage gym package for example. This is an 11 piece set which will help to increase your muscle resistance. It has ankle straps and door anchors which will help with the work out for your legs. It has anti-snap technology that is heavy duty. It comes with a carry case so you can store it easily in your garage. The package is perfect in terms of space saved and price. You can use it instead of equipment that is large & bulky. As we mentioned above, you can easily have an amazing and very effective garage gym on a budget. The main thing to keep in mind is to make sure that you only get the equipment that you need. Do you have a structure to support your gymnastic rings so that you don’t need a pull-up bar? Can you use a fence rather than a dip bar? Check how you can reduce your costs with things that are already available. When you buy things like plates and bells in bulk, you will get a better price per item. You can check with other friends and then bulk buy together! To make sure that you get the best deal, you can check for items like a Kipping Power Cage which would have safety pins and a pull-up bar. Equipment like this can help you to save money as you will use it for various types of exercises. If you want to develop your upper body strength, a pair of gymnastic rings is the best. Or even push-ups, crunches, etc. Skip the heavy and expensive dumbbells and focus on using your body weight to exercise. If you have a single garage gym, you need to keep in mind that space is a big constraint and you will need to reduce the equipment that is in your single car garage gym. 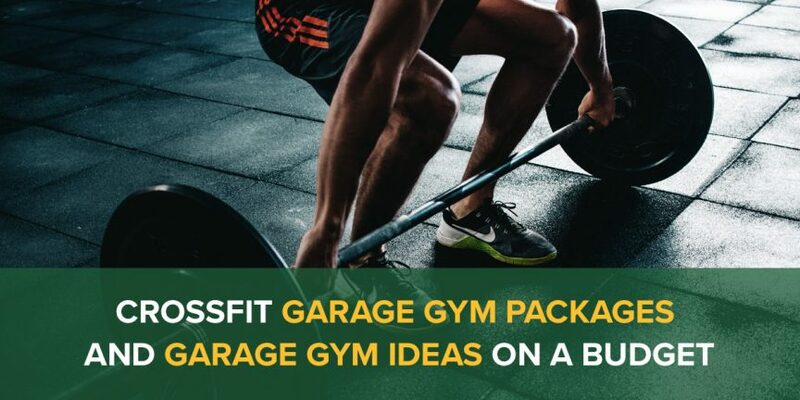 I hope you enjoyed our article on the best Crossfit garage gym packages, ideas, and how you can work on improving your home or garage gym on a budget. As always, comment below if you have any tips or would like to show off your own garage gym!